Using cannabis to treat nausea is perhaps the most popular and well-known medical use for the plant and its derivatives. It has been well-cited as a potent anti-nausea and anti-vomiting (antiemetic) treatment. The marijuana derivative called Marinol has been on the pharmaceutical market for cancer and AIDS patients since the 1970s, and cancer patients have been some of the strongest voices in favor of ending marijuana prohibition. Numerous scientific studies document marijuana’s effect on nausea, vomiting, and appetite. This effect is one of the most well-researched aspects of the plant. Scientists have even figured out how exactly pot produces its anti-nausea effect, which is rare for a plant that’s so difficult to study due to legal restrictions. Basically, marijuana activates the body’s endocannabinoid system to quell nausea symptoms and the urge to vomit. The endocannabinoid system is responsible for a host of vital processes that regulate mood, appetite, healing, memory, sleep, emotion, motor functions and various other functions. Half of the endocannabinoid system is a group of specific protein types that form openings in the membranes of nerve cells. Specific types of fat molecules form the other half of the endocannabinoid system, and their function is to fit into the protein openings in the nerve cells, kicking off a cascade of reactions. Using cannabis to treat nausea starts on the endocannabinoid level. 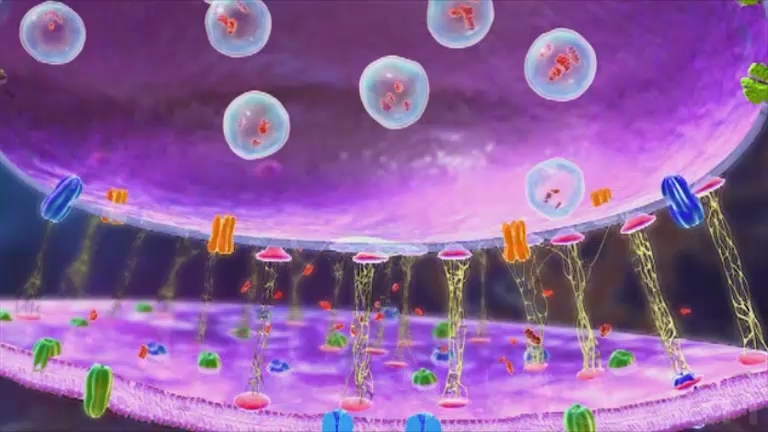 The body’s endocannabinoid system uses chemical-signaling between neurons (the purple blobs in this image). Essentially, one neuron will release a packet of chemicals called neurotransmitters to be received by the other neuron on its “receptors”. Consuming cannabinoids causes a cascade of chemical exchanges within this system that can lead to a variety of different effects. The two protein receptors in the endocannabinoid system are cannabinoid receptor 1 (CB1) and cannabinoid receptor 2 (CB2). The endogenous cannabinoids the body produces to activate these receptors include anandamide (AEA) and 2-arachidonoyl glycerol (2-AG). They are neurotransmitters, meaning they travel between the spaces between neurons (nerve cells) to transmit an impulse along a nerve. 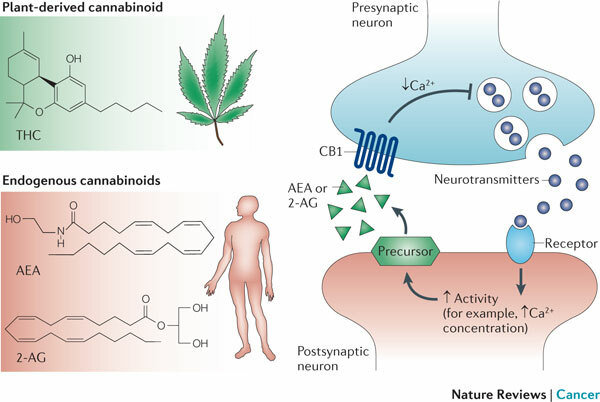 The endocannabinoid system regulates other impulses by inhibiting the flow of other neurochemicals across the synapse between nerve cells — that the spaces between cells that an impulse must traverse to continue on its path. This is why the endocannabinoid system has a hand in regulating so many diverse functions. One researcher in the journal Cerebrum called the endocannabinoid system the “traffic cop” of the nervous system. Cannabis to treat nausea: How does it work? Studies clearly show introducing agonists like CBD and THC to the CB1 receptors specifically can reduce the vomiting and nausea impulse in rats and humans. In a specific 2011 study in the British Journal of Pharmacology, the researchers tested their theory of this mechanism by introducing an “inverse agonist” to the CB1 receptors. This means it’s a chemical that fits into the protein receptor in such a way that it produces the opposite response to that which the receptor was evolved to initiate. Sure enough, when the rats received the CB1 inverse agonist the immediately began gagging (rats are incapable of vomiting). This result lends further support to the theory the CB1 receptor is implicated in the nausea and vomiting response. Since inverse agonists cause gagging, regular agonists should have an equal and opposite effect: reducing gagging. Indeed they do; the same study showed that THC suppressed This allowed the researchers to reason that THC would indeed suppress vomiting in emetic species (animals that are capable of vomiting). Cannabinoids like THC and CBD interact with the body’s endocannabinoid system, creating precursors for increasing or suppressing neural activity. Image from Nature Publishing Group. CBD has also shown to suppress nausea and vomiting and is speculated to be a result of the indirect activation of somatodendritic 5-HT(1A) receptors in the dorsal raphe nucleus, which reduces the release of 5-HT in forebrain regions. High levels of 5-HT have been shown to induce nausea, so CBD’s reduction of 5-HT can suppress nausea as well. In summary, both THC and CBD work through separate avenues of the body’s diverse and complex endocannabinoid system to reduce nausea. It’s important to note that not all types of nausea are created equal. Nausea caused by stomach issues is different than that caused by dizziness or motion sickness. While cannabis can be used to treat nausea from stomach issues, it’s unclear if it can prevent nausea caused by motion sickness, but most anecdotes do indicate that cannabis can be used for motion sickness. Is Marinol or whole marijuana better for nausea? Marinol is a synthetic THC medication that’s been around for decades. It’s approved by the U.S. Food and Drug Administration to treat nausea, vomiting and disease-induced anorexia in chemotherapy and AIDS patients. Dronabinol (a brand name for Marinol) has been prescribed to cancer and AIDS patients for its cannabis-derived anti-nausea properties. The trouble with this pure THC drug is the sometimes severe side effects, including symptoms of psychosis and others. It’s potent and relatively safe, however. Many patients prefer whole marijuana because, when smoked or vaporized, it begins to work immediately. 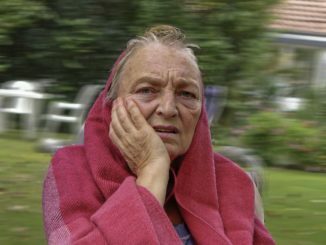 Furthermore, people with severe nausea and vomiting symptoms may not be able keep a swallowed pill in their stomachs long enough for it to work. Another factor that makes whole marijuana preferable to some patients is something called the “entourage effect.” Researchers don’t quite understand how the entourage effect works, but the dozens of cannabinoids, terpenes and other chemicals in whole marijuana work together to modulate the effect of the drug, reducing the number and severity of adverse effects. Ironically, heavy cannabis use has been linked to cyclic vomiting syndrome. Thus, it’s best to use with moderation, especially if you want to use cannabis to treat nausea.